When my wife and I bought our first house, I was so excited to decorate the outside for Christmas. In reality, my lights probably didn't amount to much, but I was proud of my little house and the decorations we had. That first year, I bedazzled the house with about 750 lights. In my mind, I blinded my neighbors and caused the nuclear power station to flip the switch to the backup generator a la Christmas Vacation. In the years following, I have shopped after-Christmas sales and added to my stockpile of decorations. Now, with 12,000 lights illuminating my house, it has gotten to the point that I need to begin putting lights up at the end of October in order to have the job completed by Thanksgiving Day--the day of the big reveal. Over the past 20 years, I've not only accumulated a lot of tiny lights, but also learned a few things that I can share with you. 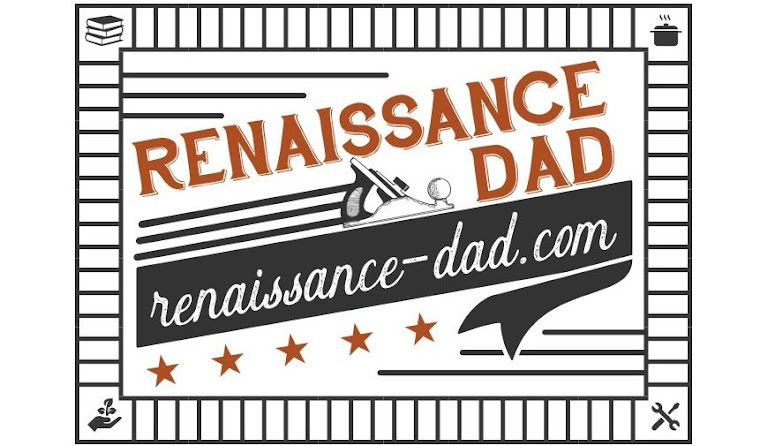 So here are the Renaissance Dad Tips and Tricks for Holiday Exterior Illumination. 1. Be safe on the ladder. Recently while I was about 20 feet up a ladder, Big A was overheard commenting, "It would be a shame if he fell. I like him." So, since our kids like us, remember a few common sense rules: Do not stand on the top rung. Do not climb up while holding things in both hands. Do not try to scooch the ladder over by attempting to jump it. Remember to maintain three points of contact (two hands and a foot, or two feet and a hand) at all times, and no, your chin and knees do not count as points of contact. 1.1 If you believe you're being safe on the ladder, you probably aren't. Last week, when finishing up the lights on the house, I was backing down from the roof to get to my ladder. The ladder tipped, I caught myself on the roof, and I heard a tear in my chest. While we're still uncertain if it's a strain or a tear, I am in pain. I was already thinking about writing about ladder safety in this article, and I still put the ladder in a dumb spot. I figured it was quicker than dragging it to a safer place, I was eager to finish my project, and now I'm laying on ice packs and glad I didn't break both legs. Please, please, please, be safe on the ladder and reassess your ladder habits. 2. If you are on the roof, be safe. Numerous times I have tried to hang over the eaves of the house to hang lights, and one little slide is more of an adrenaline rush than a roller coaster. Be safe on the roof, and make sure that you are not hanging your body over the edge. Better to find a different way to hang that strand of lights rather than spending the night in the emergency room. 3. Let your kids help. I'm not talking about Rusty Griswold going through boxes and unknotting strands of Christmas lights. I mean ask your kids if they have any ideas for how you should decorate. Two years ago my kids mentioned that we should have a star with a manger. I made a pallet star with them, and attached it to my roof-mounted non-functioning swamp cooler. They were so excited about it and asked if it was going up again this year. One of my daughters said that she thought we should do some stripes on the house this year, which is one of my favorite features of the 2018 light display. Some of the best decoration ideas on our house came from the kids. 4. No matter what great tips Clark W. Griswold has taught you over the years, you should never staple through your shingles. Any holes in your shingles will cause leaks. If you must put lights on your shingles, look for plastic light clips that you can place on the tab end of the shingle to hold your lights. 5. Speaking of holding lights in place, light holders (attached to shingles or gutters) are AMAZING! My first Christmas light hanging was wrapping lights around nails that I put in the eaves. The lights twisted every which way, and were a bit of a mess (said in a Paul Hollywood voice). When I discovered light holders, I suddenly looked like I knew what I was doing. These can be picked up in after-Christmas sales and usually come with about 50 or so in a pack. Stock up, since the sun beating down on them causes them to need to be replaced every few years (yes, we have sun and Christmas lights in Arizona). 6. Speaking of after-Christmas sales, shop the sales to get great deals, and keep going back to the stores. Last year Lowe's had net lights for Christmas trees that were selling for $40 each. They had pallets of boxes. After Christmas, they were $20, but I knew they wouldn't sell them all. After a week, they were $10, and I bought several. But when I stopped in mid-January and they still had 100 boxes or so, I spoke with the manager and got several more for $5 per box. Be savvy and look for the great deals. 7. Timers and extension cords are a must. I used to have a switched outlet that I would use to turn the Christmas lights on and off. I was disappointed when I forgot to turn them on, or when I got home from work late and the lights were off. Then I got an outdoor timer. The lights are programmed for evening and early morning, so my late nights have turned into a wonderful return home with my lights welcoming me. And there can never be enough extension cords, especially if you are spanning your lights across your yard. I used 15 for this year's project. 8. Keep a container with all of your extra bulbs and fuses. Years ago I realized the need for a centralized location for all of my spare bulbs and fuses, so I got a large container that stays in my Christmas light bin. When a bulb burns out, I no longer need to hunt and scavenge for it. It is in one container. Now if only I didn't have 38 different kinds of bulbs to go through. 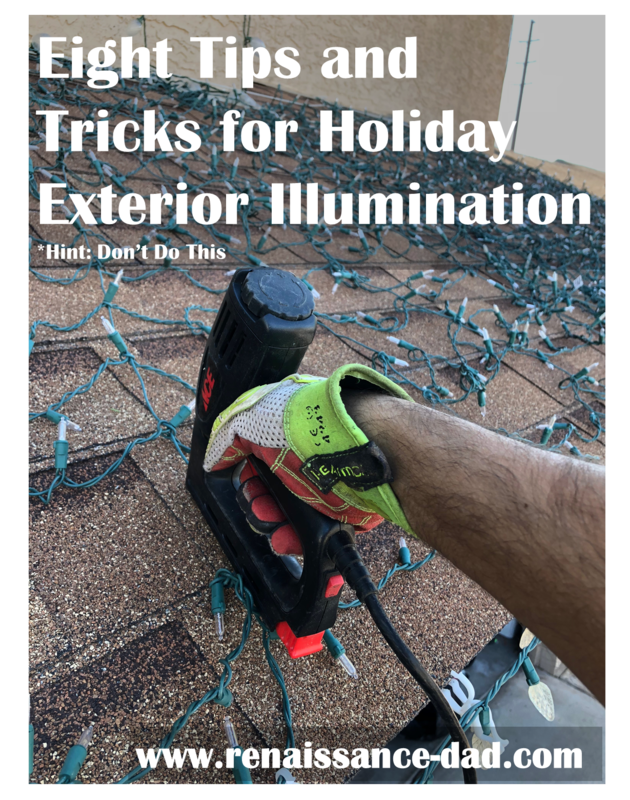 If you've made it this far in the article, you've probably figured out my personal philosophy on exterior illumination: you can never have too many lights. While I more than tripled the amount of lights on my house this year over last year, I believe that next year I have room for improvement and can add even more. "Go big or stay home," they say. And I say, "Make sure that the home you're staying in has a ton of lights on the outside." Do you have any tips that I may have missed? Drop me a line and let me know. You can either comment on this post (below), contact me (bottom of the page), or visit the Renaissance Dad Facebook page to let me know your thoughts.